A new satellite to replenish the U.S. military's preeminent space-based navigation network roared off the planet Monday, destined to circle 11,000 miles above the globe to guide soldiers in the battlefield and civilians around the world. The NAVSTAR Global Positioning System 2R-9 spacecraft rode a three-stage version of Boeing's workhorse Delta 2 rocket from launch pad 17A at Cape Canaveral Air Force Station, Florida. Liftoff occurred 15 minutes late -- as the day's available window was closing at 5:09 p.m. EST -- due to Range Safety issues. Sixty-eight minutes later while flying over the Guam tracking station, the satellite was successfully deployed into its preliminary orbit. "This was a flawless launch," proclaimed Will Trafton, the president of Boeing Launch Services. In a matter of days, GPS 2R-9 will fire its kick motor to finish the journey into the proper orbital perch and undergo a series of checkouts. Within a month, the Lockheed Martin-built satellite should be a full-fledged member of the GPS constellation, providing three-dimensional position, velocity and timing information 24 hours a day to land, sea and airborne users virtually anywhere on Earth. The Air Force says the $40 million GPS 2R-9 -- also known as SVN-45 -- will be inserted into the network's Plane D, Slot 3 to replace an aging satellite launched in December 1989. The GPS 2-5 satellite will be shifted toward the D1 slot, making it a "close pair" with the GPS 2A-11 craft already there. The GPS network features 24 primary satellites divided into six orbital planes with four spacecraft in each. Some planes also have additional satellites to enhance coverage and serve as backups. The orbiting system has 27 craft that are working today, the Air Force said, not counting 2R-9. The continuous navigation signals sent from the satellites allow users to find their position in latitude, longitude and altitude and determine time. The signals are so accurate that time can be figured to less than a millionth of a second, velocity to within a fraction of a mile per hour and location to within a few feet. GPS is crucial to the success of Operation Iraqi Freedom and the ongoing war on terror. "GPS is like water. Combat forces don't go anywhere without it now. We like to think of the 45th Space Wing as the tap," said Lt. Col. Brad Broemmel, commander of the 1st Space Launch Squadron at Cape Canaveral. 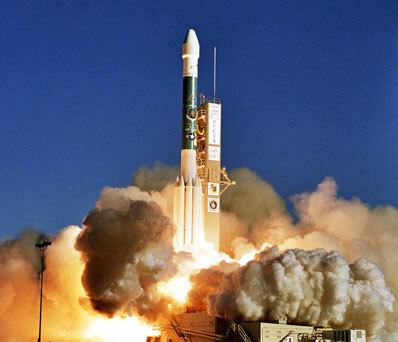 All GPS satellites comprising today's orbiting fleet were launched from the Florida spaceport since 1989. "GPS means precision -- day or night, no matter the weather. It can penetrate smoke, fog and even blowing sand to ensure our forces accomplish their mission with exacting precision with minimal collateral damage," Broemmel added. During Operation Desert Storm in 1991, GPS was a new tool that wasn't available to the entire fighting force. Troops were sent civilian GPS receivers from family members back home, said Col. Gregg Billman, a combat pilot during the first Gulf War. Billman flew missions in aircraft with and without GPS aboard. The difference was extraordinary, he said. "Flying my old 1968-era F-111 E over the expansiveness of Iraq with nothing but a stopwatch, a radar and a map is a big difference," Billman told reporters at a news conference previewing Monday's launch. "(Today) we are able to do what we did in Desert Storm but exponentially better, faster, farther." Since the early 1990s, GPS has evolved beyond its military origins. Not only does GPS provide such services as guiding troops, planes, tanks, ships and "smart bombs," it is now an information resource supporting a wide range of civil, scientific and commercial uses. With personal GPS receivers being sold in many consumer retail stores, the U.S. military estimates there are millions of civilian users of the network. The GPS market, including equipment and applications, reached $6.2 billion in 2000 and is expected to surpass $50 billion by 2010, the Air Force says. The Navigation Signal Timing and Ranging Global Positioning System (NAVSTAR GPS) was established in the 1970s to provide the military with navigation data for ground, sea and air forces. The first 11 satellites, known as Block 1, were launched from 1978 through 1985 from Vandenberg Air Force Base in California atop Atlas boosters, and served to test the fundamentals behind the GPS concept. To form the current constellation, the Block 2 and 2A series satellites started flying from Cape Canaveral in 1989 on the then-new Delta 2. 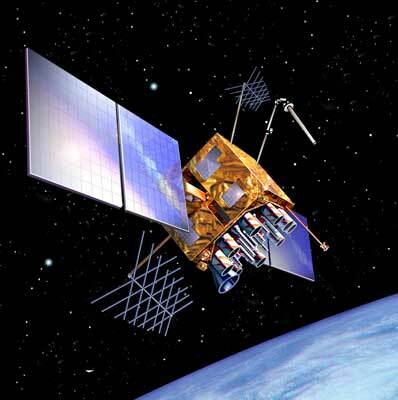 In 1997, the next-generation series of GPS satellites, called the Block 2R, debuted. However, the first was lost in a launch failure. The second was successfully deployed in July of that year. Monday's Delta 2 flight carried the ninth of 21 satellites in the family. Block 2R satellites offers technological advancements, additional radiation protection, greater fuel capacity, the ability to determine their own position and two atomic clocks working at all times, providing a "hot backup." 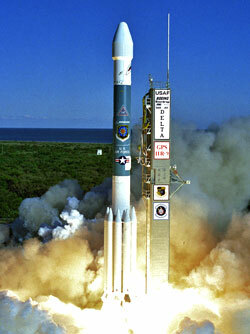 Two more GPS launches are scheduled in the next 11 months -- July 24 and Feb. 17 -- from Cape Canaveral on Delta 2 rockets.